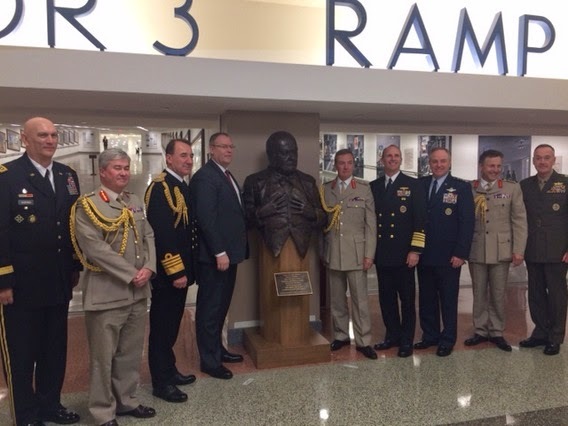 On 6 May a new bust of Winston Churchill was unveiled at the Pentagon by United States Deputy Secretary of Defense Robert Work and General Sir Nicholas Houghton, Chief of the British Defence Staff. The finished bronze, created at 1 1/2 times life-size, was crafted by British sculptor Vivien Mallock and is a gift from the British Ministry of Defence to the permanent collection of the United States Department of Defense. The unveiling ceremony was held in the Pentagon’s Hall of Heroes and was attended by senior military officers of both nations, including Marine Corps Commandant Gen. Joseph Dunford, the recently nominated Chairman of the U.S. Joint Chiefs of Staff, along with the Chiefs of Staff of the Army and Air Force and the Chief of Naval Operations, as well as the British counterparts. In addition to Executive Director Lee Pollock, The Churchill Centre was represented by Trustees Elliot Berke and Paul Brubaker.